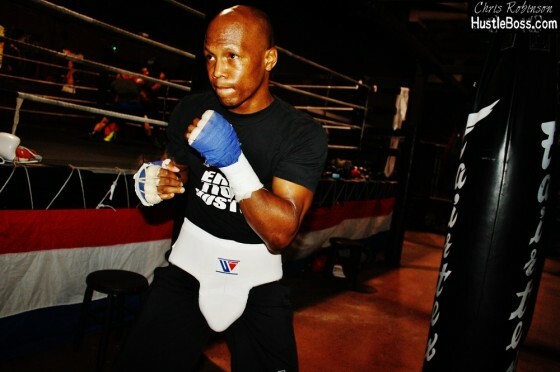 On Sep. 10, two-division world champion Zab Judah is set to return to the ring against Columbia’s Hevinson Herrera, who he faces in Westbury, New York. Judah (42-9, 29 KO’s), a Brooklyn native, has been living in Las Vegas for several years now and once again he has regained his focus towards training. 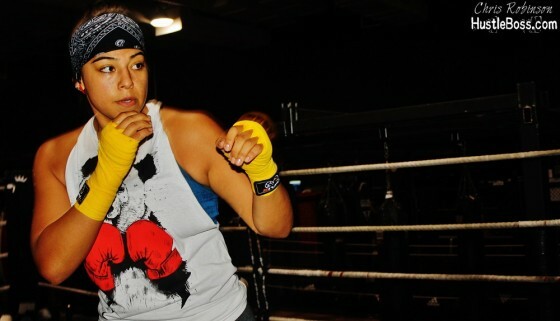 On Monday, Sep. 7, I saw a familiar face walk through the doors of City Athletic Boxing in Las Vegas. Maricela Cornejo is back in town for a brief visit, fresh off of her biggest victory to date as a professional. Cornejo improved her record to 4-1 with 2 knockouts on Aug. 15 when she scored a commanding ten-round unanimous decision over Latashia Burton. As the weeks pass by, so too do the number of championship-level fighters who continue to frequent City Athletic Boxing out in Las Vegas. On Friday evening, Hustle Boss caught up with CAB gym owner and founder Armin Van Damme, as he was putting in some work on the mitts with emerging heavyweight prospect and 2012 U.S. Olympian Michael Hunter. Earlier tonight, in Hollywood, Fl., former WBO heavyweight champion Shannon “The Cannon” Briggs stopped Michael Marrone in the second round of their match from the Seminole Hard Rock Hotel and Casino in Hollywood, Fl. Briggs (59-6-1, 52 KO’s) floored Marrone (21-5, 15 KO’s) in the first round with a right hand and finished him off one round later in the second. For bantamweight contender and WBO #6 ranked Alexis Santiago, new doors are beginning to open. 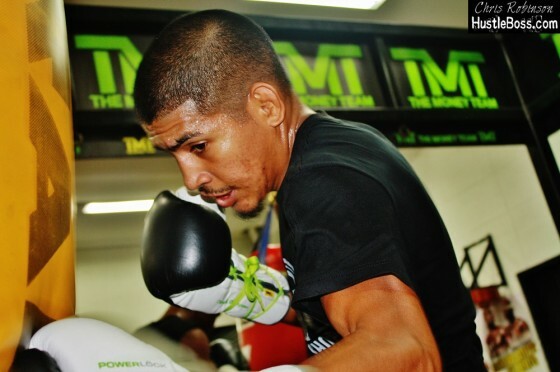 It’s been about four years since Santiago (18-3-1, 8 KO’s) walked through the doors of the Mayweather Boxing Club in Las Vegas, Nev. and the 24-year old hasn’t left anything to waste during his training in that time. Having won his last seven bouts, Santiago’s spirits are as high as ever with the recent news of his signing with Mayweather Promotions. The Phoenix native’s first assignment under his new promoter is a Sept. 8 date in Hollywood, Calif. against Fernando Lumacad from the Philippines. Recently, Hustle Boss caught up with two-division world champion Zab “Super” Judah, as he gave his prediction on the Nov. 21 Miguel Cotto vs. Canelo Alvarez clash. 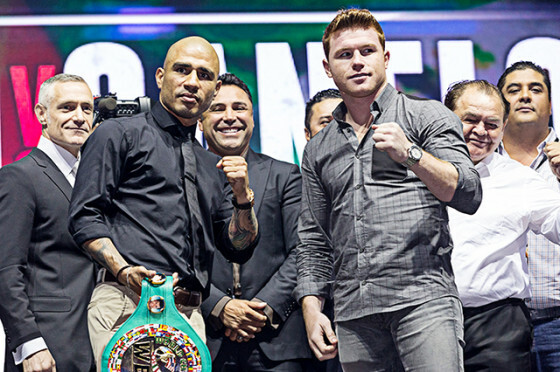 Judah is favoring Canelo slightly in the match, as he feels that he 25-year old from Jalisco, Mexico may be a little too much for the 34-year old, four-division titlist from Puerto Rico. 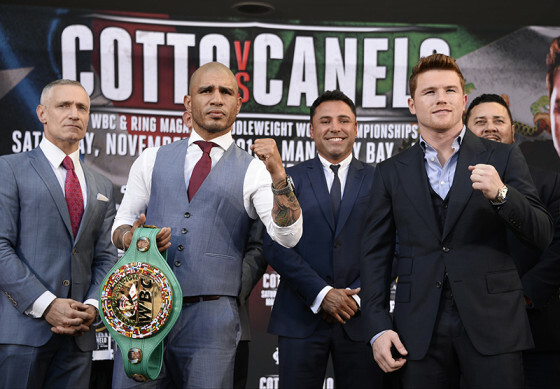 On Nov. 21, four-division world champion Miguel Cotto will lock horns with former WBA junior middleweight champion Saul “Canelo” Alvarez from the Mandalay Bay in Las Vegas, Nev.
Cotto (40-4, 33 KO’s) is the reigning WBC middleweight champion and will be looking for a second successful defense of his title vs. the younger Alvarez (45-1-1, 32 KO’s) on HBO pay per view in one of the year’s biggest events.